The auxiliary bishop of St. Paul and Minneapolis offered the challenge at the annual St. Patrick’s Day Mass at the Cathedral of St. Paul March 17. The liturgy is sponsored by the local division of the Ancient Order of Hibernians. While St. Patrick is known as the Apostle to the Irish for his evangelizing efforts on the Emerald Isle, the greatest lesson St. Patrick taught was that human beings are never alone, the bishop said. 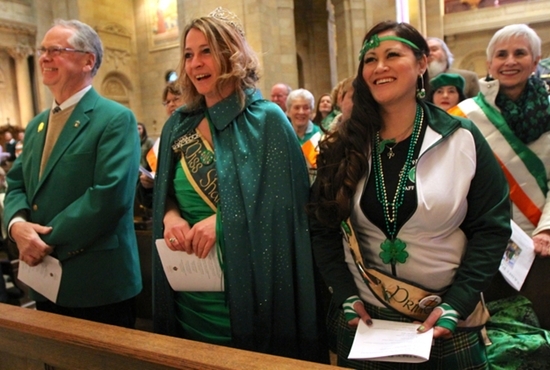 The bishop, who acknowledged, “I am French,” commended the assembly of an estimated 1,200 for starting their celebration of St. Patrick’s Day with Mass. Noting that there are two kinds of people — the Irish and those who wish they were — he showed off the green cincture he was wearing as part of his priestly garb, “to keep me mindful of my Irish desires,” he joked.